During the time preceding the Civil War, the town of Oberlin, Ohio was known for its abolitionist beliefs and was the busiest stop on the Underground Railroad, having sheltered 3,000 runaway slaves between the 1830s and 1850s. 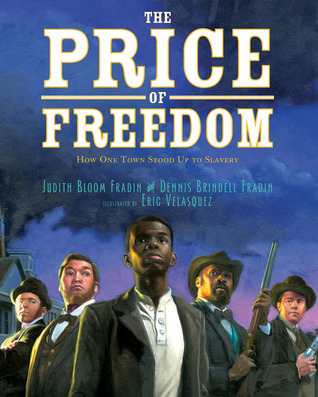 The Price of Freedom is the story of how the entire town of Oberlin rallied around John Price, an escaped slave who had been living in Oberlin when we was captured and was going to be sent back to his owner. Even though Ohio was in the North and outlawed slavery, the Fugitive Slave Act declared that even if a slave escapes to the North, his owners have the right to capture him and bring him back to the slave-owning South. Despite the fact that the men and women who stood up to Price's bounty hunters knew they were breaking the law, they felt they were answering to a "higher law" and doing what was morally right. The Price of Freedom is an incredibly inspiring story and moved me so much that I want to learn more about the history of Oberlin, Ohio. These are the types of books that will get students excited by and interested in history. I wish more teachers would abandon their textbooks and start searching for for better texts to use in their classrooms. I mean, I was so inspired by reading this book that I now want to take a trip to Oberlin, which is only a two-hour drive from where I live in Michigan. I doubt a textbook is going to ever inspire a student to say, "I want to visit that place!"